After a relaxing week in the mountains with my family I am home and readjusting to the rhythms of ordinary life. I’ve been back for two weeks but the difficult process of reentry continues. I find myself doing the same thing I do every year—looking at google maps and dreaming of faraway destinations. The late summer L.L. Bean and Prana catalogues arrive and I reinvent myself within their pages. Tailored plaid flannel shirts, performance pants, and eco-friendly sweaters attest to my new life as a homesteading adventurer in a wild landscape where the mountains meet the sea. I grow anxious for autumn. Two things help with this: sunflowers and Anne of Green Gables. As a girl, when I was sick enough to stay home from school I would watch the 1980’s CBC version of Anne of Green Gables. Between the alluring landscape of Prince Edward Island and Anne’s unmatched enthusiasm for life, her story meant everything to me. It still does. She is the epitome of “young, scrappy, and hungry.”* She has a beautiful romance that reminds me that no one less than Gilbert Blythe** will do. She even becomes a writer. I sink back into the movies and books and now the deviating Netflix remake*** and find solace. Even with all its struggles, Anne’s world feels safe. But everything in that landscape around them spoke of autumn . . . . the Lake of Shining Waters was blue — blue— blue; not the changeful blue of spring, nor the pale azure of summer, but a clear steadfast blue, as if the water were past all moods and tenses of emotion and had settled down to a tranquility unbroken by fickle dreams. “Past all moods and tenses of emotion . . . settled down to a tranquility unbroken by fickle dreams.” I am rarely past all moods and tenses of emotions. This is why I keep sunflowers on my table and Anne in my heart. Both embody the tranquility of a moment, and the hope in dreams that are unchanging. Well before I read Bloom’s words about sunflower medicine, I sat in journey meditation — a kind of lucid dreaming done while one is awake. In this journey I came upon a vast field of sunflowers— the variety that tower overhead. I knelt down in the wet earth and asked a question about my writing path. Hundreds of books flew up out of the petals, flapping their blank pages like butterfly wings. “Do not make yourself small in order to fit in.” Anne never did. Why should we? **”Match to my intellect; proponent of my happiness; friend of my heart. To be my life mate. Let us dance together as equal partners through the years.” This from the Netflix series. See below. ***So. Many. Thoughts. Let’s have tea and discuss. Every summer, Christine Valters Paintner of Abbey of the Arts (you know the woman, I work for her and quote her often) takes time off from newsletters and blogs during the summer and gives herself time to rest, play, and dream. This year, I am following her lead and taking a little blog Sabbath during the month of July. I’ll return with a new post on August 7th. I’d like to leave you with some yummy travel tips adapted from a post written during the height of my Ayurvedic studies. My relationship with Ayurveda has mellowed a little but I still find its wisdom deep and energizing. Here is my current travel perspective. Ease of travel is one of the great joys of the modern age but the changes of food, activity, sleep, altitude and sometimes company can wreak havoc on your system, leaving you feeling ungrounded, unsupported and irritable. This summer, bring along key bits of your daily routine to help you stay steady and nourished so you can enjoy the adventure. This is oh so tricky when in a new bed, or hotel. Bring along any comforts that might help such as an audiobook (my go to), a sleeping mask, calming essential oils, and low expectations. That’s right, if you know you don’t sleep well the first night or so away don’t expect to. Give yourself a little grace and plan accordingly. Traveling can be very drying. Pack a thermos and/or water bottle. (Be sure it’s empty before going through airport security or you’ll have to become the proud owner of something new you didn’t need.) Drink hot water in cooler weather and on airplanes; room temperature water in warmer climates. Drink up to a quart of hot water first thing in the am… before any coffee or tea… This will wake up your body, stimulate digestion and help stave off constipation. You know I feel about hot water! Take a few quiet minutes to yourself to breath in and out. Read a passage from scripture, your inspiring daily reader, or bit of poetry. You can do this anywhere, your hotel room, a bathroom, a back porch. Notice how this leaves you feeling more centered supported and able to go with the flow. Get in a few hip openers (pigeon etc), thigh stretches, down dogs, and backbends to ease the tension of traveling. 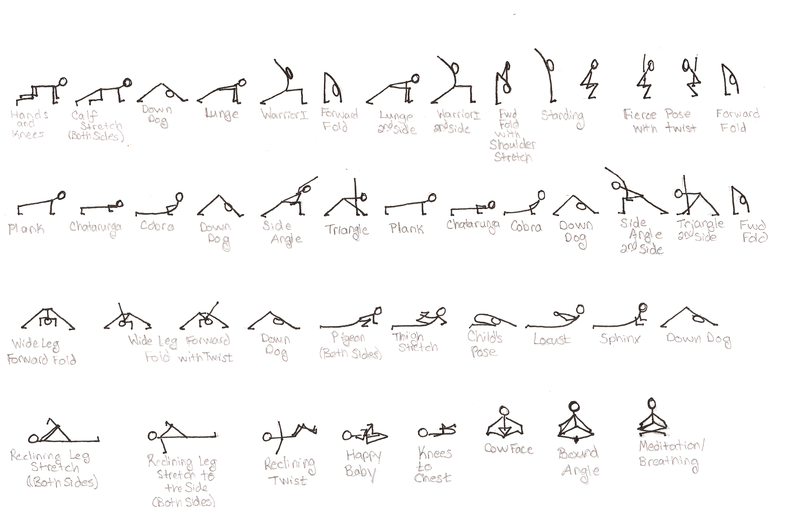 Or, if you have 20 – 30 minutes, enjoy the yoga routine on the right. Ever notice how your nose gets crusty and dry during travel, especially on the plane? Dryness makes you more susceptible to infection from germs and other nasties. Put a small dab of olive oil on your finger tip, rub it into your nostrils, maybe even your ears. While you’re at it, rub the oil all over your body. Let it soak in then rinse off. Commercial sunscreen is loaded with chemicals we don’t metabolize well. Check out the Environmental Working Group’s Sunscreen guide for an extensive list of alternatives (including Walmart Brand). I like Garden Goddess.